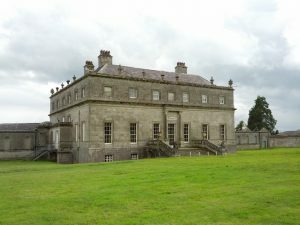 This article brings you the most beautiful house of Ireland that didn’t change a bit its initial look and landscape. For almost 300 years it was the home of pleasure, fame, art and 5 robberies. 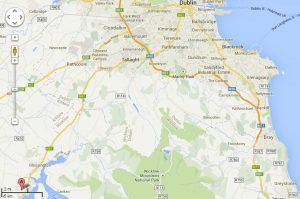 Situated at 33 km south-west of Dublin, it makes a perfect day trip! When the son of a rich brewer from Dublin (Joseph Leeson) chose to build his palace, the location was more than essential. It had to be a symphony of lake, pastures, hills and mountains that would embrace the Palladian style that resonates with balance, symmetry, proportions and the revival of the Roman antiquity architecture. Starting date of the project: 1741. Clearly money didn’t only built a magnificent property but also a title. Joseph becomes soon the first earl of Milltown and later Lord Russborough. 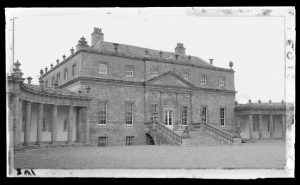 The peace and calm of Russborough House is broken by the Rising when Irish rebels take it over till British army intervenes. The house changes owners only 2 times: in 1931 and in 1952. The last owners are Sir Alfred Beit, nephew of the founder of the de Beers diamond mining company from South Africa. He moves here the family’s impressive painting collection including Goya, Rubens, Vermeer, Velasquez, Gainsborough. The house is broken 5 times and paintings are stolen, most of them being later recuperated. The family decides to donate them to the National Gallery in Dublin. In the meanwhile, the house patrons welcome and entertain the world’s creme de la creme whose stilettos’ marks are still seen in the gentle inlayed mahogany with a central star in satinwood. 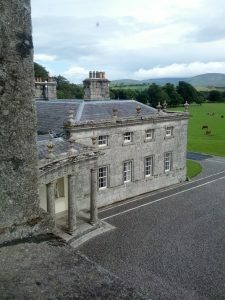 What can you see today in Russborough House? 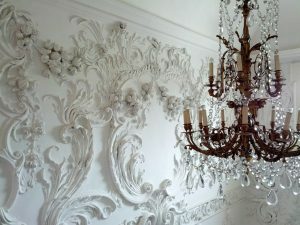 An approximate 45 minute tour of the ground floor and first floor will walk you through the high ceiling salons packed with antique furniture, tapestries, French clocks, where book leather covers match the carpets and carpets reflect the patterns of the embellished ceilings decorated by the Swiss-Italian Lafranchini brothers. There are still a considerable number of paintings from the Leeson and Beit collection you can admire too. The grounds make it for a pleasant stroll through the paths aligned with trees, clearings, a Rhododendron garden, a walled garden, a maze and a hippodrome. Craft workshops, an ice-cream parlour, a cafe and tea house are arranged in the annexes. If you dare to enter the maze please make sure you get a copy of the maze map (available at the reception) and have your mobile phone with you. Getting to its center where the statue of Cupid tops a column is going to be a challenge for many and fun is guaranteed. An unexpected surprise is the 3D exhibition organised in the basements highlighting a recently discovered archive of 5000 3D glass negatives and cinema footage of Sir Alfred’s world travels. Kudoses to the management of the estate ran by the Alfred Beit Foundation. 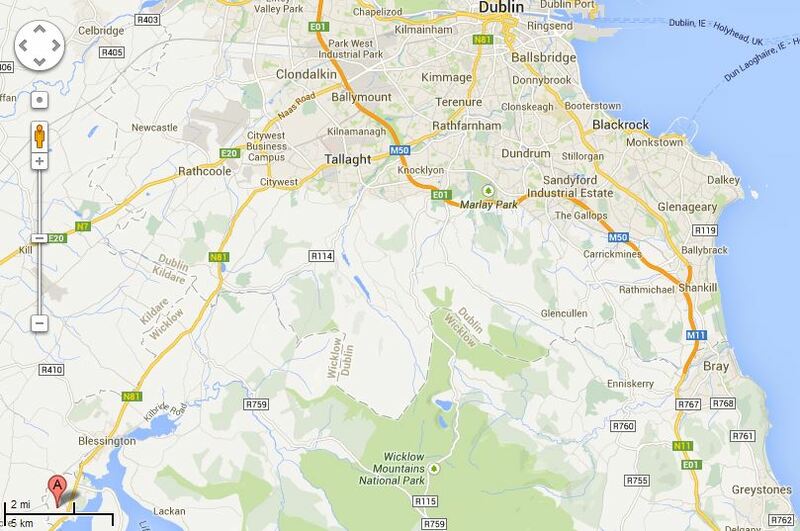 By car: follow N81 south-west, via Blessington. To Alex the Explorer extraordinaire! Thank you for sharing your account, and your never less than magnificent photography with us. Keep up the good work of encouraging us to travel that way too in your tracks!